Our camp was founded around 1987 & gets its name from "the Rosin Heels" 27th MS Infantry Co. B. The Rosin Heels were led by Major Amos McLemore also called "Old Rosin Heels." Amos McLemore was given a commission of Captain and raised a company in the Confederate States of America Army designated as Company B of the 27th Mississippi Infantry in December of 1861. Nicknamed the “Rosin Heels,” they were men primarily from Jones County and were initially assigned to protect Pensacola; Fort McRee and the Navy Yard in particular. After the Pensacola Campaign, they fought in battles ranging from Perryville to Nashville. 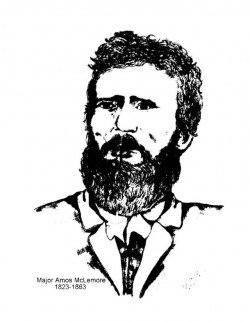 In 1863, Captain McLemore was promoted to the rank of Major and assigned the duty of rounding up AWOL soldiers from Jones & the surrounding counties in Mississippi. While visiting with Amos Deason at his home in Ellisville, Major McLemore was shot in the back on October 5, 1863 by Newton Knight. It is for the CSA Unit Major Amos McLemore formed, Company B of the 27th Mississippi Infantry, that The Sons of Confederate Veterans Camp #227, The Jones County Rosin Heels, was named. Song" Dixie" sang by "The Rebelaires."